Frost Manor resident Chris Todd is pictured here after receiving the Lindsay long-term care home’s Lifetime Achievement Award. Chris is seen here with her son, Gerry, and Frost Manor administrator Doneath Stewart. Frost Manor resident Chris Todd worked for many years as a nurse, and her career began with her caring for victims of war. 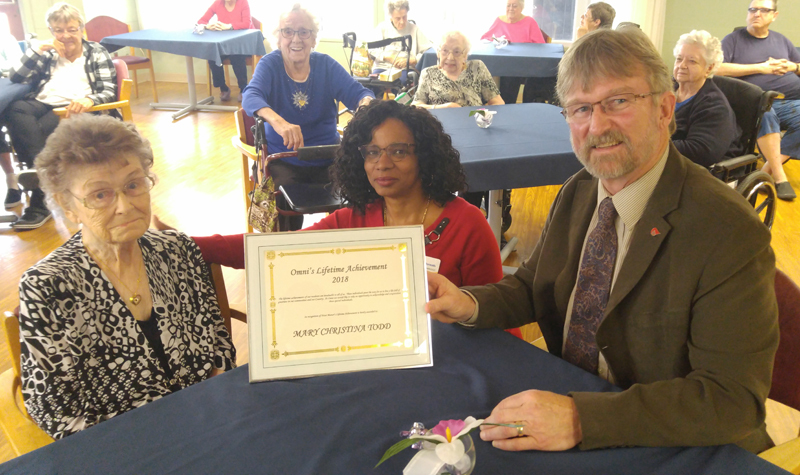 For her career in nursing and her dedication to the profession, Chris received Frost Manor’s 2018 Lifetime Achievement Award at an Oct. 19 ceremony held at the Lindsay long-term care home. Chris was born in County Mayo, Ireland. In June 1940, when she was 19, she left Ireland to take her nursing training in England. The Second World War was underway. The day after she moved into her residency, Germany began its air operations over Britain. This was followed that July by the Battle of Britain, the first major battle fought entirely by air forces, which lasted three months. To say the least, this was a challenging start to Chris’s career, her son, Gerry Todd, said during the ceremony. Gerry says there was one good thing that happened to Chris during that period: she met her future husband, a Canadian soldier, whom she married in 1945 at the end of the war. Lifetime Achievement Awards are presented to people living in OMNI Health Care long-term care homes who have demonstrated commitment to other residents, their home and country.